Based in the state capital of Montpelier, Vermont Opera Theater features local professional talent in opera, operetta, and original programs ranging from classical recitals to cabaret. In addition to performances, we offer opera workshops and master classes in classical song. Now see it in its first new appearance in 15 years, as presented by Right Here Productions. 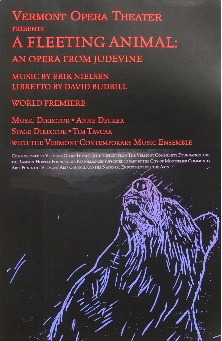 Saturday, September 19, 2015, 7:30 PM, Vergennes Opera H.
and visit our Gallery for many photos of the opera.